I am so excited to be counting down to Christmas! I love the holidays and all of the festivities that come with it. One of my favorites is an advent calendar! How fun is it to create one of my own with specific activities that are perfect for my family? 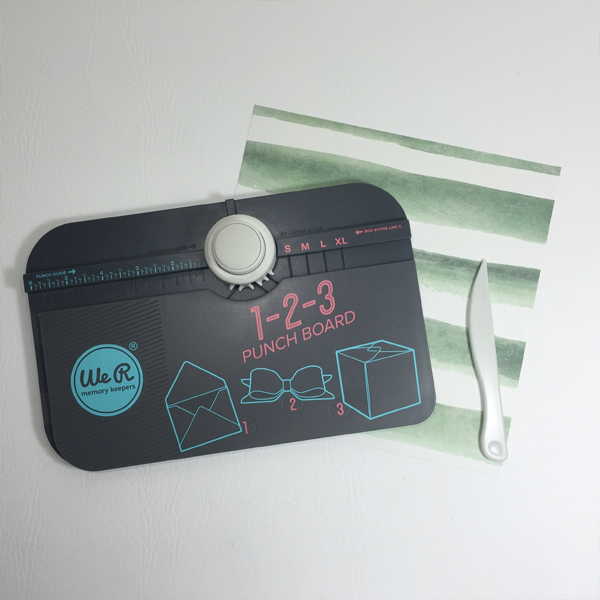 I am loving the new DIY Party Tag Punch – the shape really appeals to me and I love that it’s interactive, as well! This punch is perfect for this project. Gives a beautiful finish and is easy to use! I started with 2” wide strips of card stock that are 5.5” long. I wanted to give it a warm feeling, so that is why I stuck with the red, white and kraft cardstock. Then adding Christmas colored embellishments plus silver/gold accents! Once they were all cut and punched, then I folded the tops down so that they could be embellished! This is the fun part! I loved adding the cork stickers, from the Silver and Gold collection, to this project. The colors are perfect and the cork adds great texture. I also added in acetate bows from Clearly Posh and pleather bows from the Wildflower Collection. I couldn’t possibly stop there, I had to add alphabet stickers, dots and more to finish the advent calendar! Once I was finished — I needed to write activites on the back of each tag — that was just the cherry on top! It was fun to create the tags, but it was fun to think of activities for the season, too! The last thing to do was the add the tags to the frame! I stapled three strands of twine and then added the tags. It was so simple to create a fun, interactive advent calendar that is perfect for our favorite holiday activities. Happy Thanksgiving from all of us here at We R Memory Keepers! We hope your day is wonderful and safe. Hello, Samantha here with you today. I am beyond excited to be sharing my version of the We R Memory Keepers + Crate Paper Teepees with my Polka Dot Teepee. First let me say, if you have littles in your life, they will LOVE this! In fact, my kids (ages 7 and 9) are sitting in it together right now, reading. There’s enough room in there for both of them, a blanket, and a couple of pillows. It’s super fun! The easiest way to customize this teepee and make it your own is to paint it. The teepee comes with black paint, and I picked up some bright green and aqua blue paint to add to the mix as well. The teepee also comes with 3 different stamps. I decided to go with just the circle stamp. Stamping with paint is a lot like stamping with ink. Just spread your tee pee out as flat as you can in a well-lit area (I used the floor in my craft room), ink up your foam stamp (in this case you’ll be inking it up with paint), and press your stamp to the fabric with firm but even pressure. I suggest placing cardboard under the layer that you will be stamping on to give you a firm foundation to stamp on and to protect the rest of your project if any of the paint seeps through. I started by stamping dots all over the front of the teepee randomly, and then I carried those dots around the sides of the teepee, just at the bottom. Carrying the dots along the bottom of the sides helped give a continuity of design without the business of an all over polka dot pattern. I used most of the included flags, felt feathers, pompoms, and tassels to decorate the top of the teepee. Don’t forget you have an entire inside you can decorate, too! I thought it would be so much fun to create some polka dot lights for inside the teepee. I used honeycomb paper from the DIY Party collection and a string of lights from the Honeycomb Light Kit to create a battery powered string of globe lights for inside the teepee. I used paper from the black, meadow, and ocean honeycomb pads to incorporate the same colors from the polka dots on the outside of the teepee. I cut the paper into sphere shapes, so it looks like there are polka dots hanging inside the teepee. It really adds some extra magic to the space! This teepee is such a fun space for my kids (and to be honest, I’ve spent some time in it with them, too). It’s so easy to set up and customizing it with paints and decorations makes it such a special place to read and hang out. How would you customize a teepee? Hello WR Fans! Carrie with you today to share a special layout with you. With Thanksgiving approaching I thought I would take the time to create a layout showing you all what I am truly thankful for. Doing this layout was fun for me, not only did I get to remanence while looking through older photos I decided to make this layout using old and new WRMK lines. I wanted to show you all how you can mix and match all the wonderful lines WRMK has to offer. For this layout I used 5 different lines of old and new. To start my layout I gathered papers from WRMK Indian Summer, WRMK Teresa Collins 12×12 Snapshots Page Kit. I used embellishments from WRMK Ephemera Bits Clearly Posh and Wildflower. For my title I used Cork Stickers from the WRMK Shine collection. Then to add some finishing touches I used journal cards from Teresa Collins Snapshots Albums Made Easy and from the Indian Summer AME journal cards and stickers from the Teresa Collins Snapshots 12×12 Kit. 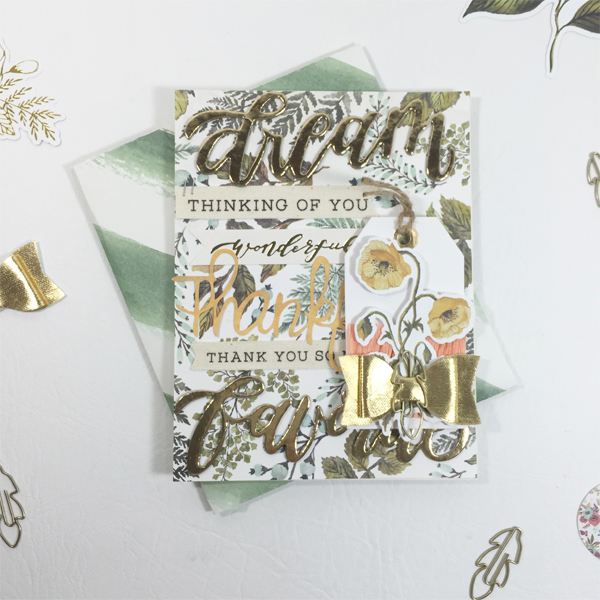 I hope I was able to give a little bit of inspiration when it comes to mix and matching different lines together and make sure you stop by and show us some of the things you are thankful for! Hello We R friends! It’s Aly Dosdall, and I’m so excited to share how I personalized the DIY Teepee kit today! This teepee is going to be a Christmas present for my 6 year old daughter…shh…don’t tell. To help keep it a secret (and because her house had the perfect corner for a photo shoot) my talented neighbor Brooke let me borrow her darling daughter and home. Thank you Brooke! My daughter’s favorite colors are pink and turquoise, so I decided to go with those colors plus a touch of metallic yellow-gold. I chose a southwest-inspired theme, and cut some pink felt triangles which I sewed onto the front of the teepee. I painted some metallic yellow-gold stripes using masking tape as my guide, and then paint-stamped some turquoise arrows using the foam stamps that came with the kit. For best results when painting, place a hard surface (like a glass cutting mat or smooth cutting board) under the teepee fabric. Place a single layer of paper towels over the hard surface to avoid paint leaking through onto your surface. I made a custom pom pom garland to coordinate with my color scheme using the new DIY Party Pom Pom Makers. Then I strung them together and hung it around the top of the teepee. I also made a pink felt banner and added it to the tassel garland to hang around the top. Then I paint-dipped the tips of the wooden poles to add some fun color at the top of the teepee. I can’t wait for my daughter to open this Christmas morning. It’s the perfect place for her to read, play with her toys, take a little nap, or just hang out. She asked Santa for a tree house, and since we don’t have any trees in our yard that would fit a tree house, this is a perfect solution! She’ll be thrilled! We’re thrilled to have designer Daniela Dobson as our guest on the blog today to close out Thanksgiving Week. 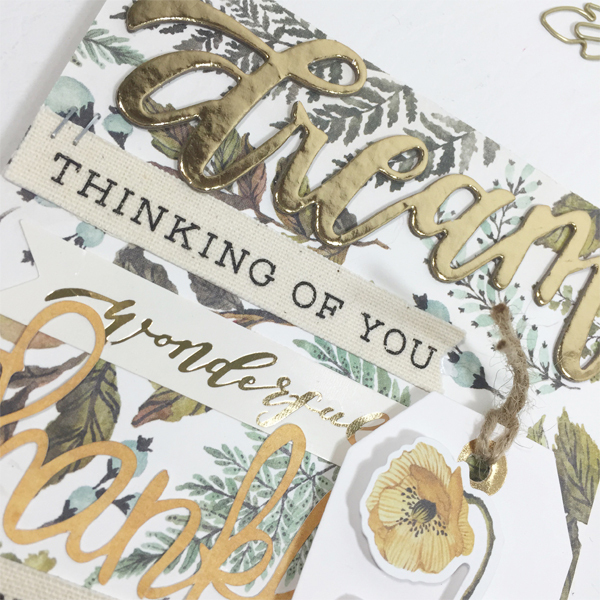 Daniela shares a bit about herself, and then shows us the gorgeous card and layout she created with the Wildflower collection. Enjoy getting to know her! My name is Daniela Dobson and I live in Dallas, TX. I am married to Peter and we have a little boy, Alex, who is 7 years old. I have been scrapbooking and stamping for over 15 years. I really enjoy challenges and strive to be innovative. I love recording every day moments, especially now, with my son. I have always kept a record of my life through journaling and photos, and scrapbooking allows me to combine those two. I don’t want to forget the important and not so important moments. When I am not scrapbooking, you can find me volunteering at my son’s school. I enjoy cooking, running, reading, and watching TV. Favorite WRMK Product: Crop-A-Dile Hole Punch & Eyelet Setter. I still remember when and where I bought it and I use it all the time. Favorite Scrapbooking/paper craft tip: Don’t be afraid to use whatever you want on your projects. Mix things up, there are no rules. I fell in love with the patterned paper with just the outline of the flowers, a blank canvas. I prepped the paper with clear gesso, which keeps the original, but gives the paper some texture and a layer so that you can add other media. I added blue and orange watercolor crayons to the background. I layered the tag, embellishments and stickers to complete the card. The layout has some patterned paper as a base and under the photos, but I mostly layered tags, stickers and embellishments on the both sides of the photos. The colors of the Wildflower collection fit perfectly with our family Thanksgiving photos. The gold tied everything together. I even fussy cut some flowers from patterned paper for the corners. Hello! Jennie McGarvey here and I am so excited to share with you the Thanksgiving decor I created. I was so excited to try some new tools to make a fun and festive decor item. However, once I got started I couldn’t stop — so I have an entire vignette for you! I started with the DIY Party Garland Punch. 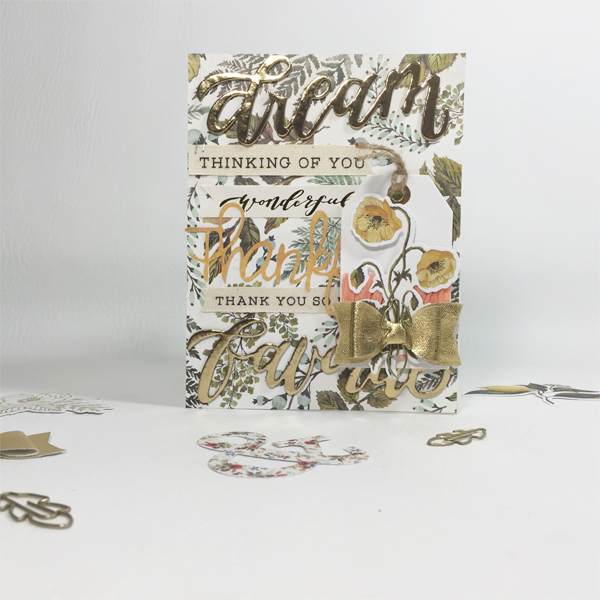 I knew that I wanted warm + festive for the overall feeling, so I selected a sheet of off white and gold card stock from the DIY Party card stock pad. Then I began punching the notched circles from both sheets of cardstock until I had the number that I needed for my desired length. Once I had them all punched, I began assembling. I was so excited that the two colors came together exactly how I had hoped. That wasn’t enough! I had to keep going. Now, I am so glad I did since I have found my favorite WeRMemoryKeepers tool, the DIY Party Pom Pom Makers. I had previously thought that the Banner Punch Board was my go to favorite tool. I still love it, but this Pom Pom maker has changed my crafting life. I was always wanting an easy way to create pom pons and this is so easy! Once I strung a lot of poms together – then I had two fun banners to string together. I pulled out a store bought banner and strung them up together. This was so easy — I couldn’t believe it! Thanks so much for checking out what I created to decorate my home for Thanksgiving. How are you using the WeR tools and collections? Make share you share with us on our social media channels. Get excited friends! Jen McDermott’s here to share the DIY Teepee she created using our brand new kit. While this fun play space will no doubt be used again and again for adventure of all kinds over the years, it’s the perfect place for her darling son to spend some quiet reading time over the Thanksgiving break, don’t you think? I have a real treat for you this morning, We R fans! Jen McDermott here, and I am SO EXCITED for you to get a look at the brand new DIY Teepee kit from We R and Crate Paper! (A match made in crafty heaven!) I had so much fun putting the teepee together and the kit made it super easy. The poles in the kit come in two pieces, connected by a plastic connector. It took no time at all to put the poles together and slip them through the sleeves. The fabric is a great weight, and it was easy to tie the cording through the pre-drilled holes in the top. All together, it took about 5 mins from the box to teepee assembly completion. 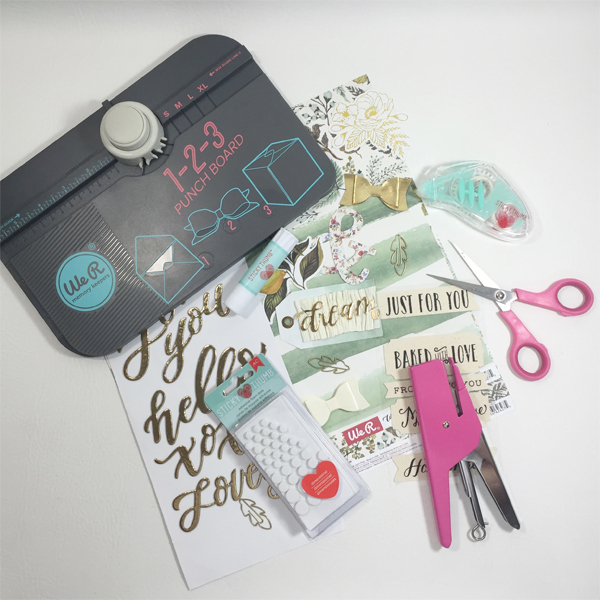 The kit comes with cute garlands, felt accessories and beads to decorate, as well as some black paint and foam stamps. I was really feeling like turning this into a 1940’s/50’s/Peter Pan kind of theme, so I grabbed some themed fabric scraps I had laying around and turned them into a tassel garland, using the cording included in the kit. The colors of the feathers and beads in the kit were perfect for the fabric and vibe. I definitely thought distressed/vintage-inspired navy stars would be perfect for the front of the tent. My kids are really enjoying using this as a fort/reading tent/”hideout”. It’s a great size for throwing in a few blankets and toys and having a chill morning at home. I foresee this tent getting LOTS of use in the coming colder months when we’re trying to get creative with our indoor play: this can be a rocketship, a camping tent, a reading/resting space…and I’m sure my kids will think of even more ways to play with it! How excited are you for this kit? How are you going to decorate yours?? Share with us on our Facebook page, or leave us a comment here! Hello We R fans! We hope you enjoyed our exciting new release announcement yesterday. You can look forward to some DIY Teepee inspiration from the design team over the next several days. We also wanted to let you know that we’ll be sharing Thanksgiving project inspiration here on the blog from now until Thanksgiving, in case you need some ideas for holiday creating. Enjoy! Hey We R fans, Aimee here. Wow can you believe Thanksgiving is just around the corner? This year has truly flown by, and I have a ton of things to be thankful for. I am so thankful to be on this wonderful team, and to be able and share this card with you today! 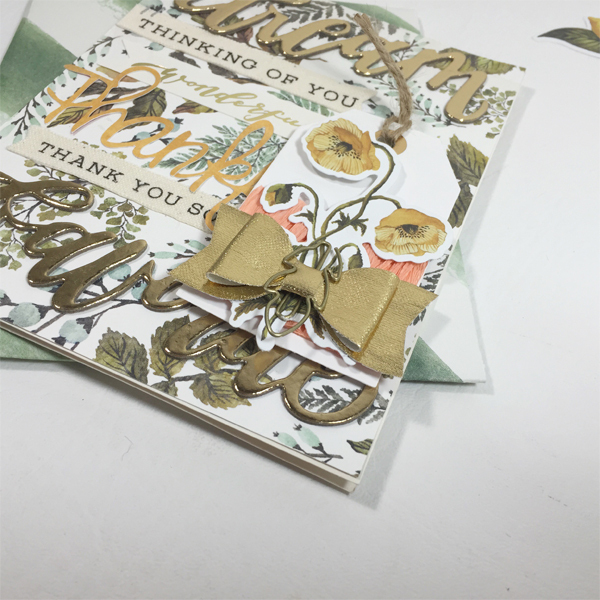 To create this card I used the Wildflower collection along with some goodies from Pebbles, Pink Paislee, and of course some adhesive from the Sticky Thumb line of adhesives. Since gold is so popular right now, I thought my main focus of my card should be just that. I simply layered the different embellishments, Gold Thickers, Stickers from Wildflower, Fabric Stickers, Tags, Ephemera, Pleather Bows and Paper Clips. I also cut the word thankful from a sheet of paper from Wildflower with my Silhouette Cameo. Of course no card is complete without an envelope, that’s where my 1-2-3 Punchboard comes in so handy. I made the envelope from the backside of the paper I made the card from, talk about coordinating! What colors do you plan on using for your Thanksgiving décor? Happy Monday We R fans! We are so thrilled to announce a unique new release! We R Memory Keepers and Crate Paper have teamed up to bring you the DIY Teepee Kit! This amazing kit contains everything you need to create a custom DIY teepee for your child or grandchild. Included are wood poles, connectors, a sewn teepee, cording, rope, playful embellishments, foam stamps, and a black bottle of paint. Use the included cording, pom pom garland, felt tassels, felt feathers, beads, and felt banners to decorate and personalize your DIY teepee. You can also use the included paint and foam stamps to add fun patterns and designs. Or, you can add your choice of paint colors, shapes, patterns, and embellishments to create a unique look. There are two kits to choose from–a light kit, and a dark kit. Both include everything mentioned above, though the colors of the embellishments vary. This fun DIY teepee is the perfect play place for your kids and their friends or cousins to hang out over the Thanksgiving break. It would also make a pretty amazing gift for the holidays, don’t you think? So, what do you think about this exciting and unique new release? How would you personalize your DIY Teepee? P.S. Stay tuned for more teepee inspiration from our design team!